Proprietary Name: Topcare Health Non Drowsy Daytime Cold And Flu Relief And Nighttime Cold And Flu Relief Day And Night Combo Pack What is the Proprietary Name? Non-Proprietary Name: Acetaminophen ,dextromethorphan Hydrobromide And Phenylephrine Hcl ,acetaminophen,dextromethorphan Hbr,doxylamine Succinate What is the Non-Proprietary Name? 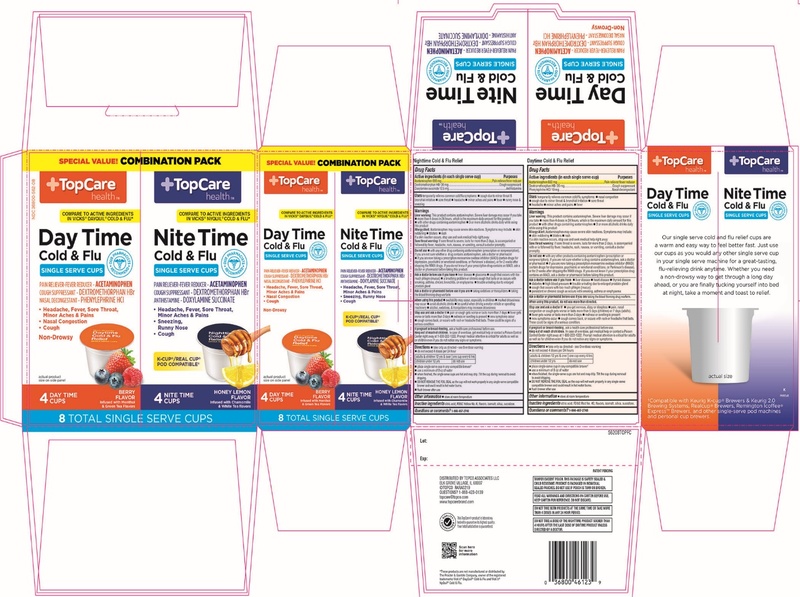 Topcare Health Non Drowsy Daytime Cold And Flu Relief And Nighttime Cold And Flu Relief Day And Night Combo Pack with NDC 36800-562 is a a human over the counter drug product labeled by Topcare Health. The generic name of Topcare Health Non Drowsy Daytime Cold And Flu Relief And Nighttime Cold And Flu Relief Day And Night Combo Pack is acetaminophen ,dextromethorphan hydrobromide and phenylephrine hcl ,acetaminophen,dextromethorphan hbr,doxylamine succinate. The product's dosage form is kit and is administered via form. Daytime: When Using This Product, Do Not Use More Than Directed. DaytimeIn case of overdose, get medical help or contact a Poison Control Center right away at 1-800-222-1222. Prompt medical attention is critical for adults as well as for children even if you do not notice any signs or symptoms.NighttimeIn case of overdose, get medical help or contact a Poison Control Center right away at 1-800-222-1222. Prompt medical attention is critical for adults as well as for children even if you do not notice any signs or symptoms. DaytimeThis product contains acetaminophen.Severe liver damage may occur if you take •more than 4 doses in 24 hours, which is the maximum daily amount for this product •with other drugs containing acetaminophen •3 or more alcoholic drinks daily while using this productAllergy Alert: Acetaminophen may cause severe skin reaction. Symptom may include: •Skin reddening •Blisters •RashIf a skin reaction occurs, stop use and seek medical help right away. NighttimeThis product contains acetaminophen.Severe liver damage may occur if you take •more than 4 doses in 24 hours, which is the maximum daily amount for this product •with other drugs containing acetaminophen •3 or more alcoholic drinks every day while using this productAllergy Alert: Acetaminophen may cause severe skin reaction. Symptom may include: •Skin reddening •Blisters •RashIf a skin reaction occurs, stop use and seek medical help right away. DaytimeIf sore throat is severe, lasts for more than 2 days, is accompanied with or followed by fever, headache, rash, nausea, or vomiting, consult a doctor promptly. NighttimeIf sore throat is severe, lasts for more than 2 days, is accompanied with or followed by fever, headache, rash, nausea, or vomiting, consult a doctor promptly. Daytime Nighttime •with any other products containing acetaminophen (prescription or nonprescription). If you are not sure whether a drug contains acetaminophen, ask a doctor or pharmacist. •if you are now taking a prescription monoamine oxidase inhibitor (MAOI) (certain drugs for depression, psychiatric or emotional conditions, or Parkinson's disease), or for 2 weeks after stopping the MAOI drugs. If you do not know if your prescription drug contains an MAOI, ask a doctor or pharmacist before taking this product. Nighttime with any other drug containing acetaminophen (prescription or nonprescription). If you are not sure whether a drug contains acetaminophen, ask a doctor or pharmacist. •with any other drug containing acetaminophen (prescription or nonprescription). If you are not sure whether a drug contains acetaminophen, ask a doctor or pharmacist. •if you are now taking a prescription monoamine oxidase inhibitor (MAOI) (certain drugs for depression, psychiatric or emotional conditions, or Parkinson's disease), or for 2 weeks after stopping the MAOI drug. If you do not know if your prescription drug contains an MAOI, ask a doctor or pharmacist before taking this product. Daytime •you get nervous, dizzy or sleepless •pain, nasal congestion or cough gets worse or lasts more than 5 days(children) or 7 days(adults) •fever gets worse or lasts more than 3 days •redness or swelling is present •new symptoms occur •cough comes back, or occurs with rash or headache that lasts.These could be signs of a serious condition. Nighttime •pain or cough gets worse or lasts more than 7 days •fever gets worse or lasts more than 3 days •redness or swelling is present •new symptoms occur •cough comes back, or occurs with rash or headache that lasts.These could be signs of a serious condition.